Sadly another rail tragedy has struck our country as an Amtrak derailment in Washington state has claimed the life of at least 6 people as of this entry. The derailment occurred on Amtrak train number 501 which was on its inaugural run of a new service between Seattle & Portland that used a recently constructed bypass track that was setup to speed up the trip time of the commute. 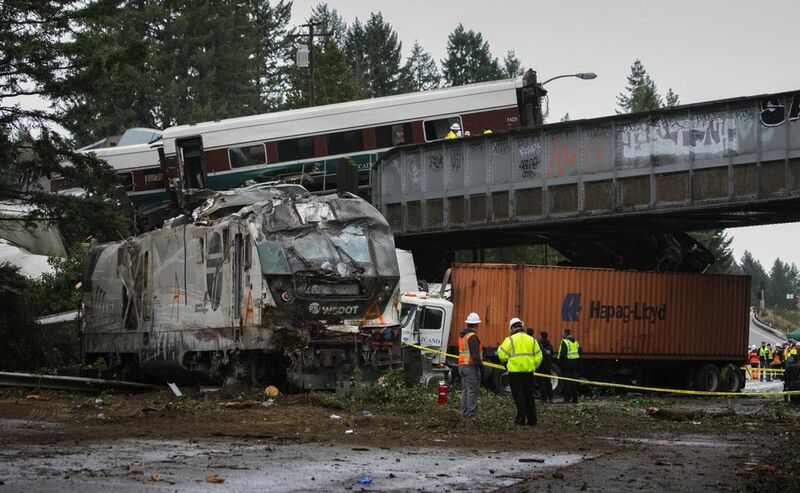 A passenger train on a newly opened high-speed Amtrak route jumped the tracks on an overpass south of Tacoma on Monday, slamming rail cars into a busy highway, killing at least six people and injuring more than 75 others, officials said. The derailment of Amtrak Train No. 501, making the inaugural run of a new service from Seattle to Portland, dropped a 132-ton locomotive in the southbound lanes of the Northwest’s busiest travel corridor. Two passenger coaches also fell partly in the traffic lanes, and two other coaches were left dangling off the bridge, one of them wedged against a tractor-trailer. On the highway below lay five crumpled cars and two semi-trucks, and huge chunks of concrete that were ripped away from the damaged overpass. I am sending my sincerest condolences to the friends & families of the victims who lost their lives. I also send the same regards to those who suffered injuries as the result of the derailment. HOW could this happen again? My husband was on the Amtrak train which derailed in Philadelphia. He was in a coma for a month on a ventilator with multiple critical injuries. He survived thank God. He will never be the same. Most of the passengers injured in this recent derailment will never be the same. The only fact determined in the Philadelphia derailment was that PTC saves lives. Why did Amtrak, The NTSB and the US gov’t repeat the SAME negligence? It is beyond negligent it is criminal.